Do I have to select a booking date at the time of purchase? No. You may buy any of our experience gifts without scheduling a specific date at the time of purchase. Your recipient will then be able to book their experience at any time for a date most convenient to them. However, if you would like to book on their behalf or book an experience for yourself, you will be prompted to submit a date after checkout. Do I have to purchase a specific experience or can my recipient choose their own experience? If you know exactly what your recipient wants, you can purchase the specific experience gift for them. However, if you are not sure which experience gift they would like, you can give one of our Gift Certificates which your recipient can apply towards any of our experiences. Are there expiration dates on your Vouchers? No. Cloud 9 Living Experience Vouchers and Gift Certificates never expire. Although Experience Vouchers do not expire, any Experience Voucher that is redeemed more than nine (9) months from the date of original purchase will be subject to the current availability of such specific Experience on the Website, and you are responsible for paying for any increase in price for such Experience at the time of redemption. All vouchers that have not been redeemed can be returned hassle-free within 30 days—free of charge, no questions asked. And remember, our vouchers never expire! Recipients may exchange any un-booked experience at any time prior to the Voucher's expiration date free of charge. Booked Experiences must be exchanged outside of the posted cancellation policy for that particular experience. Should the recipient choose to exchange for a more expensive experience they will simply need to pay the difference in cost. Should they exchange for a less expensive experience they will be able to apply the remaining balance towards an experience of their choice. Why should I buy this experience from Cloud 9 Living? 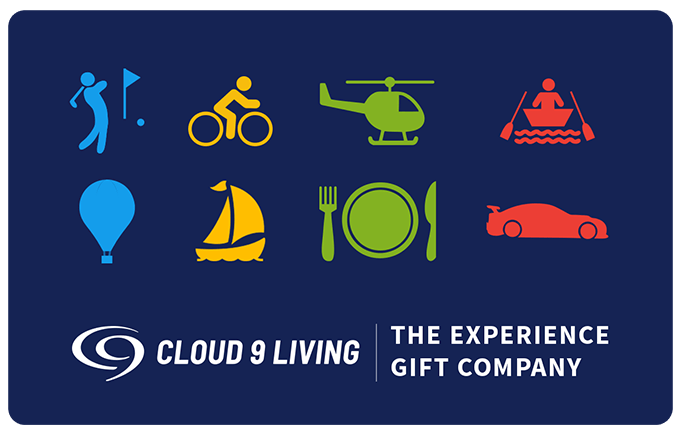 Customers sometimes ask why they should buy an experience gift from Cloud 9 Living, rather than directly from the experience provider or another company. The answer is simple - WE DO GIFTING RIGHT! No Risk, No Worries - Gift giving is meant to be fun, not stressful. That's why we've come up with flexible policies like free exchanges, and 30 day refunds. Best in Class - We vet all our experience providers to ensure your gift recipient is in great hands. We check their years in business, awards, certifications, safety record, and constantly monitor customer reviews. Rest assured, they're AWESOME! Exchanges - With over 2,200 experiences nationwide, we've got something for everyone. So if your gift recipient decides they'd like to exchange the experience you gave them for another of our 2,200 amazing experiences - no problem! Use our top navigation menu to search for experiences by Region or Experience Type. You can also visit our Most Popular Experiences page for some great suggestions! If you can't decide exactly which experience to give, try one of our Gift Certificates and let the recipient choose an experience of their choice. Can I buy multiple gifts at the same time? Yes. Whether you are buying for multiple recipients or buying multiple experiences for one lucky person, you can buy all of your gifts during one transaction. During the checkout process, you will be able to customize each gift with a message for the recipient, and can select multiple locations for shipping. Certain experiences have specific requirements for participation; such as age, height, weight, health or other factors. This information is provided on the experience detail pages, and is also proivded to the recipient during the booking process. Cloud 9 Living does its best to include all restrictions or requirements on each experience detail page; however, we cannot take responsibility for any inaccuracies, so please contact us with any questions if you are unsure of certain restrictions for a specific experience. It is the responsibility of the recipient to comply with all necessary requirements prior to participating in an experience. Cancellations made as a result of the inability to meet the service provider’s requirements are non-refundable. Now that I am finished shopping, how do I checkout? When you are finished shopping, click on "View Cart" in the top navigation to view your shopping cart details. Assuming there are no changes, click Checkout and follow the steps to complete your purchase. How are your Experience Gift Vouchers delivered? Our Experiences Gift Vouchers are delivered via email. We can email the Voucher directly to your recipient or we can email a printable voucher to you. You will also be able to print the voucher after checkout. Furthermore, you will be able to select the date which your email voucher is sent to your recipient. Can you resend my Email Voucher? Yes. If you have a Cloud 9 Living account, please visit your Account Summary and click on the "Resend Voucher" button next to the related order / voucher. If you do not have an account, please contact a customer service representative at 1-866-525-6839. Can I include a customized message with each gift I buy? Yes. You can include a customized message with every gift you purchase. This can be done during the checkout process on the shipping information page. To book your experience, first click the Redeem Voucher link in the upper right corner. From here, you will need to enter your gift voucher number and register it to your account. Finally, you will be able to select your dates and submit your booking request. If you have already registered your gift voucher, please Sign In to your Account Summary and click the "Vouchers Received" tab. From here, click the "Book" button next to the related voucher and submit your dates. Please note the recommended booking notice for your experience. This information can be found on the specific detail page of your experience. Is there an expiration date for my Cloud 9 Living Experience Voucher or Gift Certificate? Can I exchange the experience I've been given for another one? Yes. You can exchange the experience you have been given for a different one. Unbooked experiences can be exchanged at any time prior to any applicable Experience Voucher expiration date FREE OF CHARGE. Booked Experiences can also be exchanged but must be exchanged outside of the posted cancellation policy found on the relevant Experience Detail page at www.cloud9living.com. If the experience you are exchanging for costs more than your original, you will be required to pay any difference in cost. If your new experience costs less than your original, the remainder will constitute an unredeemed balance remaining on such Experience Voucher. Can I combine multiple gift certificates towards a booking? Yes. To combine multiple Gift Certificates or Experience Vouchers, first register them all to one account. Next, select one of the certificates/vouchers and proceed with the booking process. Select the experience you would like to choose and when you are prompted for additional payment you will be able to select another certificate/voucher to apply towards the balance. Any remaining balance will then be prompted for payment with a credit card. What if I book an experience that is less in value than my voucher? Should you book or exchange for an experience less expensive than the Experience of Gift Voucher you were originally given, the remainder will constitute an unredeemed balance remaining on such Experience Voucher or Gift Certificate. What dates are available for my experience? Certain experiences are offered daily. Others are offered only on specific dates or during specific seasons. The dates available for each experience are found on the experience detail page. What if I book an experience, but have to cancel? Once you have received a booking confirmation, cancellations and rebooking are subject to the posted cancellation policy found on the relevant Experience Detail page at www.cloud9living.com for a particular Experience. May I transfer my Experience Voucher or Gift Certificate to someone else? Yes. During the booking process you must inform Cloud 9 of the name and pertinent contact information of the person to whom you are transferring to. Can I bring additional people to my experience? Yes. Please inform us during the booking process if you would like to add people to your experience. Assuming the experience provider has availability on the day of your request, you will be able to add additional people at the current experience price. Note that there are certain restrictions as to the maximum number of participants and spectators for each experience. These details can be found on each experience detail page. Certain experiences are subject to weather conditions. In the case of questionable weather, please contact your experience provider at the number provided to you on your booking confirmation email. Please refer to the map located on the experience detail page for the location of the experience. Full location and contact details are included in the confirmation email, once an experience is formally confirmed. How do I exchange my experience? In order to exchange an experience, you must first register/redeem your voucher. Once redeemed, you'll be prompted to book your original experience or exchange it. You can also exchange a voucher by going into your account, clicking the My Vouchers Tab and click exchange.